STARS ARE INCREDIBLY MASSIVE SPHERES OF GAS THAT EMIT ELECTROMAGNETIC RADIATION. In our galaxy there are over 400 billion stars. Astronomers estimate there to be over 10 SEXTILLION (10 with 22 zeros after it!) stars in the observable universe!!! As you may expect with so many stars in the universe, there is tremendous variety in the kinds of stars we have observed. WE CLASSIFY STARS INTO GROUPS BASED ON THEIR PHYSICAL PROPERTIES. Stars vary in size from smaller than the Earth to 2,000 times more massive than the Sun. 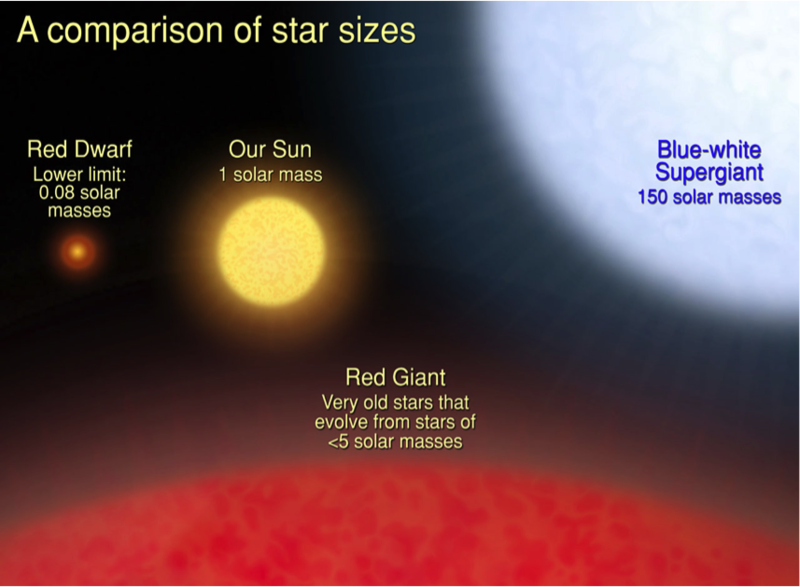 COMPARED TO OTHER STARS, THE SUN IS AVERAGE SIZE. Stars are also extremely variable in terms of temperature. Spica, a very hot star has a surface temperature of 28,000 degrees Celsius. Antares on the other hand has a surface temperature of only 2,000 degrees Celsius. LUMINOSITY IS A MEASURE OF A STAR'S BRIGHTNESS. IT DEPENDS ON THE STAR'S SIZE AND TEMPERATURE. THE H-R DIAGRAM IS A SCATTER PLOT OF IMPORTANT STARS. THEY ARE ORGANIZED BY THEIR SIZE, TEMPERATURE, COLOR, AND LUMINOSITY. WE MUST BE ABLE TO USE THIS CHART TO DESCRIBE THE DETAILS OF ANY STAR ON IT. TO FIND THE TEMPERATURE AND COLOR OF ANY STAR ON THE H-R DIAGRAM WE JUST NEED TO LOOK STRAIGHT DOWN TO THE X-AXIS. TO FIND THE LUMINOSITY WE JUST LOOK OVER TO THE LEFT SIDE OF THE CHART. YOU WILL MOST LIKELY HAVE TO ESTIMATE THE EXACT LUMINOSITY USING THE SCALE PROVIDED. TO FIND THE SIZE OF THE STAR WE JUST LOOK OVER TO THE RIGHT SIDE OF THE CHART. THIS IS A VERY INFORMAL MEASUREMENT, IT CAN ONLY BE USED TO TELL US IF THE STAR IS SMALL, AVERAGE, OR MASSIVE.